GwenElf.. making a mock up is a good idea.. but I am still trying to figure out what size of pattern to buy first! I don't want to end up buying several patterns/far too much fabric. I can usually buy clothes that are size 10 in the store, and when I take my measurements, the patterns say I should use size 16. Basically, pattern sizes aren't the same thing as clothing sizes! But, they do tell you what size the finished garment will have, and it's generally bigger than you'd want. So, what I do now is make myself a size 14 and alter the shoulders, since mine are much narrower than the pattern . That comes out pretty well, but again, if this is for a fancy dress...you will want it to be very fitted. So, you'll probably want her to put the thing on inside out and and fit the seams to her precise dimensions. Does that make sense? If it's McCAlls, you should be able to buy a pattern set that comes with several sizes, and 14 or 16 being the max. That should work. Do *not* make her a size 8 pattern and expect it to fit! Thanks so much Mith. I kind of figured I shouldn't make a size 8.. but size 16 didn't sound right either. 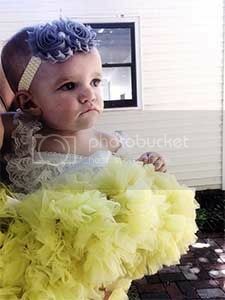 When we were looking at gowns in the stores, which ran small, she would usually wear a 10 or 12. Last year I picked up a beautiful gown at Goodwill (she got invited to prom only 11 days prior & everything was so picked over/no time to make something) It was a size 12 designer dress and I had to take it in so it would be snug along the chest (and not slide down/fall off! The McCalls pattern I was looking at came in 2 sizes. A 6-12 and a 14-20. I do think the mock-up will be a invaluable idea... and then.. like you said.. try it on inside-out/alter is a great idea. I still need to decide which size pattern to get.. as it seems she might fall somewhere inbetween. But that might be more trouble than it's worth. GwenElf.. great ideas--but I doubt I have time to wait, in this case, for the patterns to go on sale (which, if I recall, was September-ish) and they do NOT take patterns back around here.. even if they have not been cut (I've already asked). I think I will just have to cough up the cash and buy both. Or buy the one I think most likely and buy the second one only after I determine it isn't going to work for us. Speaking of pattern sales.. those are awesome! Last time they were on sale I picked up about 7 awesome patterns for Renaissance/fantasy/hobbitish/costume clothing.. but nothing like what I need now! Hopefully I will make use of them sometime soon. It's nice when you don't have to pay an arm & a leg for a pattern & can more easily combine a top with a skirt with a neckline with a corset, etc.. Ah well.. the $1.00 sales are GREAT. JoAnns had Simplicity patterns on sale for $1 over President's Day weekend And Butterick are $2 Thurs. - Sat. At least around me; I don't know if these sales vary from place to place. Rather than go to the trouble of buying them, look on the pattern for information about the finished garment size. Usually it's at the bottom, under all the fabric requirements. My philosophy is that it's easier to fix something that's too big than something that's too small. So, buy the 14+ pattern, cut out the size 14, and if the dress is too loose, take it in. I'm a little hesitant to tell you to get the size 12, because that might be too small! (Keep in mind I've never seen your daughter, so this is all guess work on my part.) Do all the 'adjusting' before the dress is done, so you don't have to fool with stuff like attached interfacing, etc. Also, if you are worried about buying too much fabric, you can always take the instructions out of the package in the store and look at the layout they are suggesting. That gives you an idea how much wiggle room you have. I just made a dress where I decided I was only going to buy 3 1/2 yards of fabric, regardless of what it called for...and it worked . But I did have some idea of how much I was altering the length (I'm short, and patterns are for tall people), so it was an educated guess. As it turns out, I was about an inch short, so I had to fix some things when I made the hem. But it was cheaper than buying 4 1/4 yards and having a ton left over! We don't have a Joann Fabric close-by so I often don't think of them, however, if I am going to look for some nicer fabric I will have to make a trip into Milwaukee and they do have Joann's. The stores in my town also do not carry Butterick, so maybe I can see what patterns they offer. I guess I was just a bit surprised by the sizing and was wondering if it just applied to the formalwear. I have made myself outfits and even though I might need a size larger than what I would buy in ready-to-wear or do some altering.. I don't recall ever having such a large gap in size. With the type of dress I am thinking of making it probably won't be that big of a deal.. but when the shoulders/bustline/neckline are off it's a real pain (even if it's a bigger size, which I agree is better to work with than too small, the neckline can be too wide.) Fortunately for me.. there will be no neckline. Thanks for all your help peoples! Hey all! I finished my sweater, as well as made a skirt. Now I'm working on a coat (gotta have it finished by Saturday!) inspired by the coat Penelope wears in the movie Penelope. The main features are the orange trim at the seams and the totally mismatched buttons. I'm excited. luthien.. how lovely. What are you making it for that you need to have it done by Saturday? Actually I'm just moving back to Ohio on Saturday, and I won't have much time to sew then! I can knit much more easily than sew down there. I just want to get the sewing out of the way before I move! I loved that coat from the first photos they released a year or more ago and even more so the shoes. I was looking for something that would look like those shoes for a while and in the end I was - surprisingly - successful, though mine are eggshell-coloured. Good luck with the coat! My dress only needs the ribbon sewn onto the hem and buttons sewn on but I have simply revelled in the idea that it is pretty much done, that I did take myself to hand and got sewing again, so I have been reluctant to finish . I love the shoes too, Aurelin! I've been looking for a pair of them but I haven't had any luck so far. All of her clothes in the movie are fantastic, actually! I love her outfit with the red shirt and the skirt that she wears at her house I think the first time she shows herself to Max. That skirt is very cute and in truth, I don't think it would be hard to make it or remake some skirt by adding ribbons for the stripes and crocheting the flowers to sew on the skirt. Guess who has actually been sewing? Yes, me! I made Luthien a St. Patrick's Day skirt and an Easter dress. The dress was lovely, but such a pain to make. I used some beautiful silver brocade with Japanese style branches and flowers on it and wow was it torturous to work with. Note to self: never work with brocade again. The fraying is enough to drive one mad. I also made my husband a housecoat. I've actually been planning on making him a housecoat for about 2 years. He's really tall and has broad shoulders so it's hard for him to find one that fits well. So I took this star wars fleece blanket panel to use as the back and did most of the rest in black. I added a lot of fabric to the bottom and it still came out a bit shorter than I wanted but much better than anything he's bad before. It looks really awesome and was surprisingly easy to sew. Unfortunately, I haven't been as proactive about taking pictures. So... hopefully pictures will come soon, but probably not before I'm done with my current project anyway. Anyway, in other news, the new baby is a girl and is due in June. So a baby blanket will be in the works soon too. We're probably going to stray away from Tolkien names this time after all and go with something Irish. Yeesh Undi! Your productivity has rendered the rest of the guild silent!! Congrats on the baby girl, by the way! Just a bit longer! on Luthien playing Inuyasha! That's so cute!! Two of my friends cosplayed Sango and Miroku this past weekend at ACEN. Speaking of which! 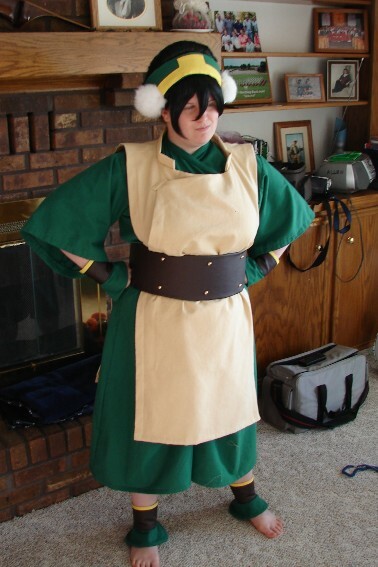 I finally finished my Toph (from Avatar) costume and wore it this weekend at ACEN. Walking around in nearly bare feet kinda hurts! Here's a picture of the character, and one of me dressed as her. Really basic details on construction are up on the costumer's website. She's blind, so all I had to do for that was take my glasses off and walk. My daughter is into Inuyasha too. Undomiel, if you ever work with a fabric that frays (again), you might want to try fray-check. It's a colorless liquid you can brush on the edges & it will keep it from fraying. Sounds like you've been pretty busy besides..AND a new baby on the way! Joy! This summer I'm going to be making a colonial-era style costume from J.P. Ryan to wear to Colonial Williamsburg in September and a camp I volunteer at in June. More info and pictures to follow. As soon as I figure it all out myself. MY PETTICOAT IS DONE!!! I shall post pictures soon. Ok, here's a picture of my skirt. The picture's really, really, really big, though. I'm not quite sure how to resize it. Hey, nice carpet ya got there! Looks just like our carpet! Aaaanyhow, nice skirt!! Very pretty fabric! Announcing the arrival of Fiona Rose on June 8, 2008! So, now I've finally gotten rid of my pregnant belly and hopefully will be able to sew for myself again soon. I haven't been able to make myself a costume in ages! So with luck (and Fiona's mercy) I'll have updates soon! In the meantime, I'll try to get pictures of Luthien's fairy costume posted. That was my last project, unfortunately. Yayyyyyyy!!!!! Congratumalations, Undi!!! :hug: Beautiful name!! .... right, sewing. Yeah, I'll get right on that. I finished my Revolutionary Era pioneer costume! I should have pictures of it by the end of the week. I'm now working on a medieval/fantasy dress. Fiona Rose what a lovely name. Celtic/Irish... and flower names are always good (says hobbit-momma). ShadowSwallow what is your skirt for?? They are usually fairly easy to take in. I love the colors/fabric. Rose, I made this for a historical kids' week-long day camp that I've been volunteering at for eons. My costume has been improving gradually over the years. Now it's quite presentable. Very nice. Do you have a hard time getting authentic fabric or don't you have to worry about that? On on hand I didn't worry too much about it, but on the other hand I tried to get it as authentic as possible. My shift (which you can't see ) is a 50/50 cotton linen blend. Cotton isn't accurate, but it's so difficult to find linen in as much variety as you need it that it works as a good substitute. My skirt and short gown are both 100% cotton from the "homespun" section of the quilting section at JoAnn Fabrics. I love the feel of these, and they're as accurate as you can practically get. My pocket (which, again, you can't see ) is a 50/50 linen/rayon blend (the only man-made material I'll tolerate in my sewing). My apron is 100% linen and is of an appropriate weight. It's also unbleached and made of rough-ish threads. The cardinal rule of reenactment costuming is: NO POLYESTER EVER!!! And I follow this rule religiously. I follow this rule all the time. I HATE polyester. Natural fibers not only feel better and look better, they are also sooooo much easier to sew with. I fell in love with linen in particular. It's the perfect fabric, in my opinion. I am slowing getting back into sewing. I finally made Fiona's baby blanket the other day and patched a couple pairs of pants my husband has been begging for months for. Hopefully some bigger projects will be underway soon.